Overview - Swing back into action with Sterling Archer — the world’s greatest spy — and the agents of ISIS for another hilarious season of cocktails, carousing and animated awesomeness! Follow the team around the globe, from the mysterious Bermuda Triangle all the way to the Vatican, as they bicker, backstab and bumble their way through assassination plots, an ill-advised marriage, an unexpected pregnancy, and a venomous snake bite in a very, very bad place! Packed with terrorist threats, sexual shenanigans, and all things inappropriate, “Archer” The Complete Fourth Season comes fully loaded with outrageous top-secret extras! Check out our reviews for seasons one and two. Every now and then a show will come along that looks like it's right up my alley, but still somehow eludes me. FX's 'Archer' is one of those shows. The animated spy comedy series has garnered many positive critical reactions and constant recommendations from friends, but I've still never managed to sit down and watch the damn thing. That is, until now. While jumping into a show during its fourth season probably isn't the best idea, these thirteen hilarious episodes prove to be fairly accessible to newcomers while seemingly giving fans of the series more of what they love -- which, as far as I can tell, basically consists of insane verbal sparring, amusingly dysfunctional characters, twisted visual gags, and funny spy antics. Wow, why did I ignore this show for so long?! Season four once again follows the exploits of ISIS (International Secret Intelligence Service) and its insane group of agents and personnel. 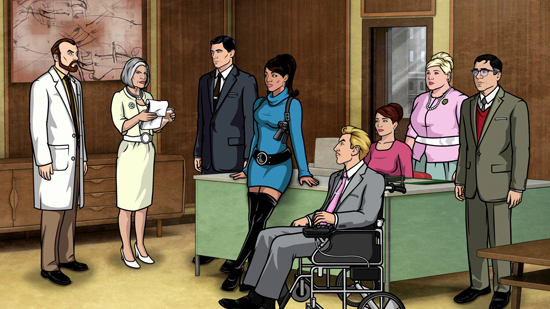 Headlined by the arrogant but charming(ish) Sterling Archer (H. Jon Benjamin) and run by his overbearing mother Malory (Jessica Walter), the agency takes on various top secret assignments. This season sees the dysfunctional team embark on missions involving Mexican coyotes, Papal assassinations, reality cooking shows, flatulent dogs, and deep sea laboratories. And all the while, the group's various enemies attempt to thwart their goals, but their most dangerous threat always remains their own incompetence. Much of the show's raunchy and witty humor is actually dialogue driven, heavily relying on the amazing voice actors' incredible comedic timing and effortless deliveries. I've been a big fan of H. Jon Benjamin since I first heard his distinctive voice as Coach McGuirk on the criminally overlooked series 'Home Movies,' and as Sterling Archer, the comedian once again turns in a hilarious performance. A self-centered, womanizing alcoholic, Archer is like a frat-boy version of James Bond, and his arrogant asides, drunken outbursts, and obscure references are among the highlights of the show. Benjamin's laid-back, sarcastic delivery perfectly suits the character, giving him a distinct, slightly atypical quality that clearly separates him from other debonair secret agents. But as incompetent and egotistical as the man can be, he actually happens to be an incredibly skilled spy, leading to a few legitimately daring and impressive moves throughout the season -- that is, until they are quickly undercut by another boneheaded move or screw up. The rest of the ensemble is made up of similarly amazing vocal performers, including Chris Parnell, Amber Nash, Jessica Walter, Aisha Tyler, Lucky Yates, and the show's creator Adam Reed. Beyond Benjamin, though, the real standout is actress Judy Greer. As ISIS' mentally unstable secretary Cheryl, Greer often steals every scene she's in. Her character's loose grip on reality, dangerously ditzy personality, and twisted penchant for rough sexuality prove to be an explosive combination, leading to some of the season's biggest laughs. Together, the exaggerated gang of disagreeable sociopaths bounce of each other perfectly, and while they are often at each other's throats, one can sense that deep down they really -- well, actually, they probably really do hate each other. And if the squabbling main cast wasn't enough, we also get a great assortment of guest stars, including Timothy Olyphant, Anthony Bourdain, Eugene Mirman, Kristen Schaal, and the great Jon Hamm. Of course, all that talent would be pointless if the writers didn't give the performers anything worthwhile to say, and thankfully, the scripts prove to be witty, intelligent, and outrageously vulgar. Though traditional spy action does make its way into the series, many scenes instead focus on the downtime between missions or the moments where things suddenly go wrong, forcing the team to scramble to find a solution. The writers also frequently employ a creative bit where the first line at the beginning of a scene will often relate to or finish off the last line in the previous scene, giving the words sly double meaning. And all of the outrageous shenanigans are wonderfully realized through the series' distinct animation style, which blends realistic character designs with a simple retro style. Movements can be a bit stiff at times, but the look works very well with the tone of the series, emphasizing the vocal performances while still bolstering the comedy with subtle facial expressions and a few funny sight gags here and there. 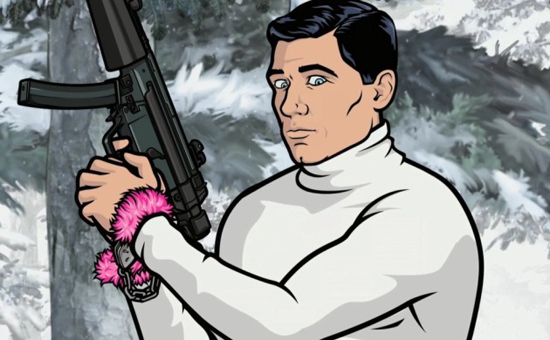 A clever, crude, and extremely entertaining spy parody filled with crazy characters, cool animation, intelligent writing, and hilarious performances, 'Archer' really is a funny show. While this was my first major introduction to the world of Sterling Archer and ISIS, I found the series to be easy to jump into and am now looking forward to catching up on the previous three seasons that I missed and the currently airing fifth season. Those who are already fans know exactly what to expect here, and even newcomers who enjoy sharp, raunchy comedy with an espionage twist should definitely not hesitate to embark on this mission. 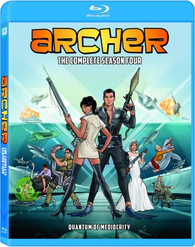 20th Century Fox presents 'Archer: The Complete Season Four' in a 2-Disc set. Two BD-50 discs are housed in a keepcase with a cardboard slipcover -- and in a playful little addition, the slipcover actually features a removable mustache on Archer's face. After some skippable trailers, the discs transition to standard menus. The show is provided with a 1080p/AVC MPEG-4 transfer in the 1.78:1 ratio. Crisp, clean, bright, and colorful, this is a wonderful image that pops from the screen. The show's simple but realistic animation style is perfectly rendered, highlighting the 1960s inspired designs and comic book influenced visuals. Detail and dimension are of course limited compared to live action efforts, but clarity is strong throughout with very sharp lines, solid depth, and even some impressive textures on background objects. Thankfully, artifacts like banding and aliasing are virtually nonexistant. The show's color palette is vibrant and bold and contrast is strong with bright whites and deep, inky blacks. More or less pristine, this really is an impressive transfer, and while it's not quite worthy of a 5-star rating, fans should have very little to complain about here. The series is presented with an English DTS-HD MA 5.1 track along with optional English SDH, French, and Spanish subtitles. While the front soundstage is actually quite lively and involving, surround use is disappointingly muted, somewhat limiting the track's overall sense of space. All of the show's witty dialogue is clear and easy to hear throughout, giving ample presence to every angry tirade, silly reference, and sparring verbal jab. And while this is a very dialogue driven series, the show's spy thriller aspects still get ample attention. Explosions, shootouts, and car chases litter the season, and these effects all feature strong separation and imaging across the front three speakers along with decent low frequency response. Voices are also spread directionally among the front soundstage when called for. Unfortunately, however, surround activity is very subdued, with only some minor ambiance here and there. Even action heavy scenes are virtually silent in the rears, preventing the soundscape from ever fully enveloping the listener. While surround use is oddly minimal, the show's real focus is dialogue, and all of the characters' hilarious quips are given due emphasis. Likewise, the action elements get solid attention from the front soundstage, even if the rears rarely engage. 20th Century Fox has put together a disappointingly slim but still entertaining duo of supplements. All of the special features are presented in 1080p with Dolby Digital 2.0 sound and no subtitle options. Fisherman's Daughter (HD, 3 min) - This is a very funny anime parody that the characters in the show create. The animation style is spot on and the twisted humor is hilarious. Archer Live! (HD, 20 min) - As the title suggests, this is a live reading of scenes from the show with most the cast in front of an actual audience. The group seems to be having a lot of fun playing off of each other, and their improvisations are really amusing. H. Jon Benjamin's introduction is particularly hilarious. 'Archer: The Complete Season Four' is a funny, outrageous, and witty animated spy comedy that succeeds thanks to intelligent writing, amazing vocal performances, and a creative visual style. The video transfer is fantastic, beautifully rendering the animation, and while the audio mixes lack substantial surround immersion, they're still very effective. These discs only feature two supplements, but thankfully they prove to be quite entertaining. Fans of the series should not hesitate to pick this set up, and even newcomers (like me) should definitely consider jumping into the insane, vulgar, and hilarious spy world of Sterling Archer.